Waterfront House and Guest House on Tisbury Great Pond. Boat to one of the best private beaches on the Vineyard and enjoy the Vineyard the way it used to be at our waterfront family home. The property, which is surrounded by a 180-acre farm owned by an old Vineyard family, is on the waterfront of Tisbury Great Pond. The main house, Pastime Hall, which is located directly on the water, was originally a lodge used for square dances and community gatherings. It features a knotty pine great room with huge stone fireplace and new, comfortable furnishings. The main house has one large master (queen bed) bedroom, full bath, fully-equipped kitchen, and an outdoor shower. A large wrap-around deck has gorgeous views up Pear Tree Cove toward Quansoo Beach. The deck is furnished with a teak dining table (with umbrella), chairs, bench and steamer chairs. A two-bedroom GUEST HOUSE, located a stone’s throw away on the two and a half acre property, has two bedrooms (one with queen bed and one with twin beds), living room, complete kitchen and dining area plus its own yard, deck, outdoor shower, pond view, and telephone line. A private, third bedroom suite with twin trundle beds, full bath, half kitchen, and a small private deck is adjacent to the garage. Herb garden, blueberry bushes and flower garden on property. Ideal for a family with older children or two/three couples. The house has its own dock. Use of a Lund motor boat with ten horsepower motor, canoe and single kayak are available for an additional fee. Beach pass and key with private parking rights allows access to private stretch of Quansoo Beach. Another private stretch of beach is a 10-minute motor boat ride (or paddle) across beautiful Tisbury Great Pond. Alley’s General store and West Tisbury are a five-minute drive up a dirt road; the airport is ten minutes away. 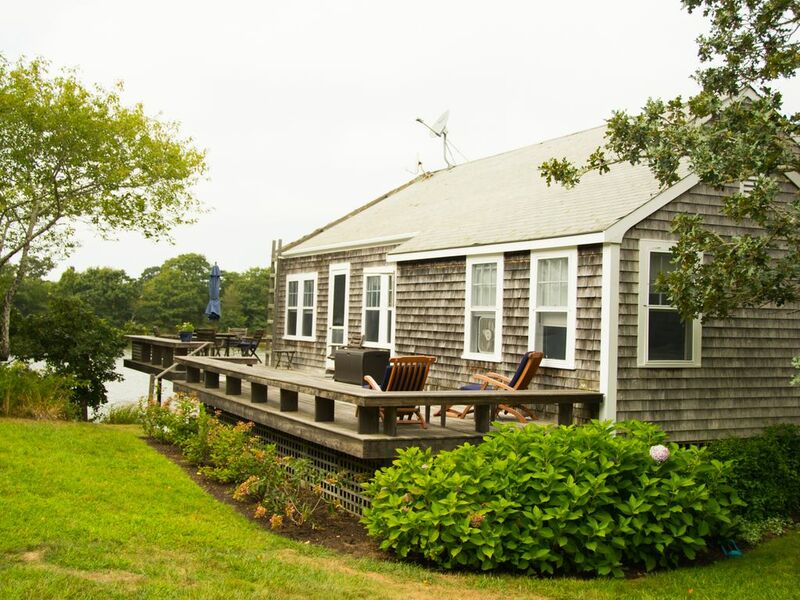 West Tisbury renters can also get tennis court passes and reservations, and parking passes for Lambert's Cove, one of the Vineyard's most beautiful sound beaches. After renting on the Vineyard every summer since 1949, Ben and Sonya O'Sullivan purchased Pastime Hall in 1965. They built the guest house to accommodate guests and their college-age children, John and Chris, who had been spending summers on the Vineyard since the ages of five and two, respectively. Ben and Sonya later expanded the main house and its deck, renovated the garage apartment, and added the dock. The property is now maintained and used by John's daughters, Sarah and Kate, who have spent part of every year of their lives here; John's wife, Susan; and Chris. We try to keep the place up-to-date without losing its old-Vineyard personality (you can't build right on the water like this any more). We hope you agree that we have struck that balance. Incidentally, Bill Clinton first came to the Vineyard in the spring of 1969, on his way home from his first year at Oxford, to attend a gathering organized by John and others of moderate anti-Vietnam war activists from the McCarthy and Kennedy 1968 presidential campaigns at this house. Our parents (and grandparents) chose this place because of the beautiful great room and its combination of relative privacy, beautiful water views, and ready water access to the wonderful, uncrowded beach together with its central location, affording convenient proximity to down-island restaurants and shopping and up-island beaches and vistas. We tend to make only one or two (or no) trips out a day -- just to get fresh fish and vegetables and newspapers (we buy our eggs in our neighbor's barn)- and otherwise read on the deck and/or boat across to the beach. The sunsets are spectacular, and the views of herons and osprey and other water birds during the day aren't bad either. Motor boat included in rental. Canoe and single kayak available for additional charge. (2) Wrap-around deck to main house overlooks pond. Boats (Lund with 9.9 hp motor, canoe and kayak available for fee), answering machines, Two full kitchens with spices, linens and beach towels provided, washer & dryer on premises, Apple ipod dock, Bose radio and cd player, Weber charcoal grill (BBQ), Cuisinart, Blender, miscellaneous equipment such as bikes (3), helmets, bike rack, volleyball net, beach chairs and umbrellas, Boogie boards, life preservers, boule and croquet equipment included in rental. Renters pay a $250 cleaning fee. Pets will be considered on a case-by-case basis, and an additional deposit will apply.